R is away at the moment. It was a planned away time. Not sure if he will come home Saturday night, or Sunday or even Monday. It is with the gods who are forecasting good and bad times. He kindly made me a huge lasagne. I have eaten a serve for dinner a night ago, had a smaller serve for lunch the next day and have a serve saved, and that was only half. The remaining half I put in the freezer. I was thinking of having poached eggs on toast for dinner tonight. Have I mentioned that R cooks very well and I don't? I ended up ordering a pizza from the shop across the road. It was nice. It is a bit strange being home alone, especially at night. I keep wanting to tell R something, but he is not here. Still, not all bad. He didn't take Mother out on Thursday, so I don't have listen to him moan on and on about Mother, which can nearly be as bad as Mother moaning on. Also I don't feel the responsibility to be as tidy as I would normally be. I will get to doing that, in my own time, rather than feeling the need to be immediately tidy. We are rather compatible in us both being very tidy. I love time alone at times, doing my own thing, but whatever I do, R is always somewhere in the background, somewhere in my mind. How could he not be after 38 years. If you can read between the lines, yes, you probably have it right. It is a bit of a worrisome time. But it is not all bad. I have shut his bedroom door. There is no reason to cool his bedroom if he is not here. I expect our 3 monthly electric bill will be at least $1 less. Hey, maybe even $2. And I did not have to put the dishwasher on today. Not enough dishes. More saving. Maybe this living alone is not such a bad thing. For Melbourne Cup, a horse race, we have a city based public holiday and a number of cruise ships full of attendees to the Cup were in port, including the loser ship that had to moor at the industrial Victoria Dock, this year the short straw being drawn by the Pacific Dawn. Their arrival and departure times are well staggered, which is just as well. I've seen some great photos of the four ships in port, but I can only offer this modest photo. You get the idea of how crowded it would be with perhaps two thousand passengers plus per ship, and then the ferry passengers, many with cars, motor bikes and bikes, and some with caravans, along with the normal freight traffic to our southern island state of Tasmania. It would be just crazy man! Amazing cruise ship fact #73. Port of Melbourne has the cruise ship schedule up online for the first half of 2021 and all cruise ship arrivals and departures between now and then. Clearly there is no spontaneity with cruise ship schedules. This is probably of very limited interest to most, but as much for my own benefit, it will be on the record. May to July, massive tram works were underway down below. I don't have a great picture of the intersection before the works began. For trams it was a simple intersection with straight through tracks. It was more complicated for cars and a often the scene of minor accidents. As you can see, it also can be very congested. A van coming the wrong way down the northern arm of Toorak Road and facing opposing traffic. Note the parking spaces with parked cars, about twenty of them. The parking now occupied and barriers up. Down the hill progresses the tram track excavation for what will be the re-routed number 58 tram. The track trench is right where that earlier car parking was. The work was done quite quickly. Track layers are working their way down the hill. The tracks have reached St Kilda Road. Some overhead wire support poles had already been installed. Plenty of work at night. This is a pole base, to which an overhead wire support pole will be bolted. Marks painted all over the road. Someone must have made a mistake as previous marks have been blacked out. Traffic is beginning to be restricted. The double left turn slip lane has been closed and the area dug out. Concrete is being poured between the new tracks. Filling goes onto the new concrete. A traffic island is being dug up. The pole is in place. Fill in place between the tracks. There was a little army of people in white at night. The asphalt is laid on top of the compacted fill. The bus stop has been removed and some kerbing taken away. Up until this point, apart from the closure of Toorak Road, the traffic was managed through the intersection. We must have now reached the 1st of July, and the intersection is closed to cross traffic. Part 2 and 3 to come. If you are having trouble commenting on my blog of late, it would be quite pointless to ask you to make a comment on this post to tell me, although if it is an inconsistent problem, maybe you can. Chinese companies bought 38 per cent of all the residential property development sites sold in Australia last year, spending $2.4 billion, according to a Knight Frank report this year. Should we feel concern at foreign companies owning our properties or are they no worse than our own local developers? British investors hold huge tracts of low productive farmland in Australia. Chinese companies own a good bit of productive land in Australia. It seems the Chinese own rather a lot of inner suburban development sites and apartments. America and New Zealand are also owners of things Australian. South Africa owns quite a bit of Australian companies. Yet, apparently our economy is reasonably successful. Is Australia a good model for the rest of the world, that is to allow huge foreign investment and ownership of land. I only took one year of economic studies at school and I can't remember much beyond a baker making bread. Was it from his profits that he could pay the prostitute, who in turn paid her pub bill, where the pub paid its rent to..........etc. Perhaps not. This overseas ownership issue does not sit very comfortably for me, but that is just instinctive, not based on sound thinking or being educated in the matter. But one thing I am sure of and even a fool should see the logic, if immigration into Australia is suddenly stopped, Australia's Ponzi scheme economy would collapse. Suffer ye children, the expensive housing, the choked roads, the overcrowded public transport, the hospital waiting lists, the shortage of schools; as with foreign investment, foreign ownership of our lands (well kind of Aboriginal land really) and a huge number of immigrants, we are such a rich country. Try to go for a family barbeque on a Sunday at one of outer suburban parks now? Good luck with that one. While I feel I have much to look forward to in life, not having to participate in society and deal with its increasing difficulties will be such a relief when I stop working. R often enough hears my rants about traffic when I am trying to get home from work. Yep, I am traffic too, and part of the problem, but I am not sure I ever asked for this. I potted up a punnet of petunias in a large purple pot, probably over planting. They were standing up like Brazilian goats, but now while it is not hot, the humidity is was at around 70% and they were not happy at all. They like it hot and dry. Just wait a day or so petals, and all will be well. Well, the photo did not work out too well and they look a bit better now, even though it is still humid. I have been pinching out the tips of the petunias. Saturday night was a birthday dinner celebration for our friend who turned 75. I was discussing with someone his own technology devices and to my surprise, he has the same tablet computer I have. We agreed that the storage needs to be larger for us to store 'movies'. My tablet storage space is the same as my phone. We went onto to discussing Youtube and how helpful it is with almost anything. He has shrunk since an illness and finds shirts too long for him. Although he knows his way around a needle, cotton and a sewing machine, he did not know how to shorten a tailed shirt. Youtube told him how. i think he mentioned biased tape, or was that unbiased tape. I thank people who upload their knowledge to Youtube. Youtube people have helped me more than once, and it has again just have now by telling me how to properly prune potted petunias. Britain, Canada and Europe, as I have seen, all have generally wonderful hanging baskets of street flowers during their summers. 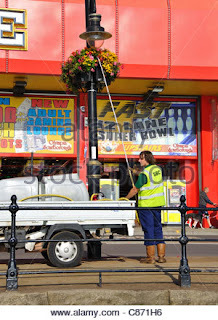 I thought maybe it was too hot here in our summers to have hanging baskets of flowers. There are some rather horrid hanging baskets of fake flowers in Toorak Road, South Yarra. But no, Sydney has hanging baskets of real flowers. I saw a man with a big long stiff black hose, curved at the end, pumping water into the baskets. It is all about the cost of maintenance, I suppose. The man I saw in Sydney had a much bigger hose than this man in England with his very thin one. The flowers have since been removed and tips pinched out until the plants grow a little.